RC Radio: Empress Garden & Spaceship, additional comments! 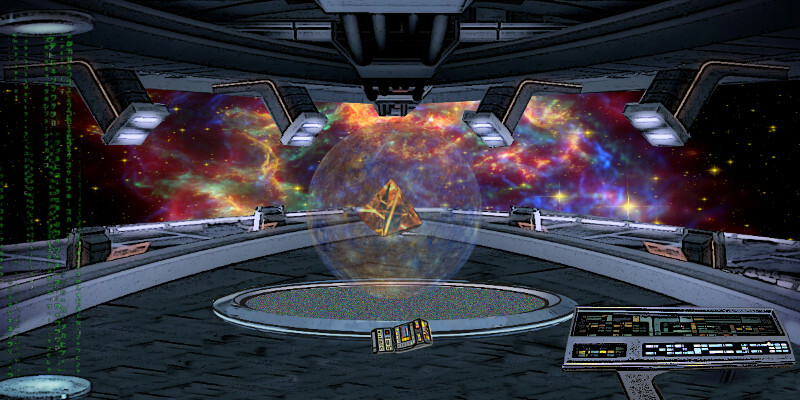 On the “Empress’ Starship” you get to meet the energy of star birth. The ultimate birth is the birth of the Universe: the Big Bang!. This is a creation of true biblical proportions. What could compare to that singular event? However when you create your reality and unveil a new self that is what you are doing: birthing a new reality within the creative medium that is the universe. Be that a star, flower, or a new job, it is a creation. It has been a long trip though the Tree of Life tarot and now we come to the first of the three active energy cards: Empress, Magician, Fool. It is in this place that the changes you have worked on so hard finally come to break into your reality, However keep in mind that your journey will not be complete until you reach “Blind Mans Bluff” (Fool tarot card location). 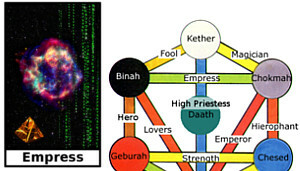 The “Empress’ Starship” is located between Binah and Chokmah. Binah supplies the motherly energies and Chokmah supplies the energy of spirit. The energy of spirit in this place is much more refined than in Priestess Heights. There you had to combine raw spiritual energy with intent and knowledge to get it to do something. On the “Empress’ Starship,” this energy has already been refined for use by Chokmah and your own self though the previous paths. This unique energy makeup is what gives this place an almost conscious spiritual awareness or intelligence. Your future, – your much future self – may be engaged in the creation of other realities, perhaps even other universe’s stars and planets. “All That Is,” created the universe from a single seed. That seed was a complex series of thoughts, desires, and wishes compacted into a tiny speck of matter. Your journey through the Tree of Life tarot has been very similar. In each tarot card location you have come to understand more about yourself and your own wishes and these things have gone into your “Pyramid of Tomorrow.” This vision of your future will become the seed that will create in your reality, when the time is right. One of the cool things you can do here is to observer the birth of a star or even the Big-Bang itself. The spirit guides here may be ETs or human masters. They can help you to understand how your vision of the future can get converted into the reality you experience. They will even help you to birth the new self you been working on, if you been doing the previous 20 locations. If you have been doing all the previous locations then the primary quest here will be to activate your new self (or reality). If you are working on some other project that needs birthing, than the guides here can help you with that process as well. You will see the familiar “Pyramid of Tomorrow” that holds your vision of the future. It is held in a stasis field waiting to be emptied and uploaded into a star-seed to create its reality. When you are ready, go over to the control panel and upload your vision and set it free. Then watch outside as you birth a new star! Your new self, reality, or creation has now been born. You can preview what your vision of tomorrow may look like by using the Tricorder that you will find here. If you do not like what you see or want to tweak it a bit more, then do not initiate star-birth. Instead, go visit some of the other previous tarot card places to fine tune your creation. It is okay if you are not ready to birth your new reality. It is better to get it right than rush it. The guides here can help you to understand that as well. Once you activate your reality using the star-birth process, you can no longer change the form of what will spring up. But you can manipulate and change what happens along the path. In the upcoming “The Stage” location (Magician tarot card), you will learn how to do that. Here you just begin and experience the new birth you have brought to life. The one time gift here is the energy of “acceptance.” “Acceptance” is an important energy. Once your new reality has started taking form, you must learn to accept and adapt to how it actually appears within your reality. The final product of your reality will depend on many factors, how you shaped your wishes in many of the lower Tree of Life cards but especially in High Priestess Heights, where your vision is fine tuned, and Infinity Valley, where destiny and spirit shape your reality so that it can have meaning and create harmony, and any of the other places where your “Pyramid of Tomorrow” shows itself. Here, you can meet the Commander of the Empress’ Starship and even the Empress herself. She can take many forms and use traditional as well as sci-fi characters. Masters and Angels are very playful beings and they love to take other forms, so do not be surprised if she appears as someone from a TV or movie. 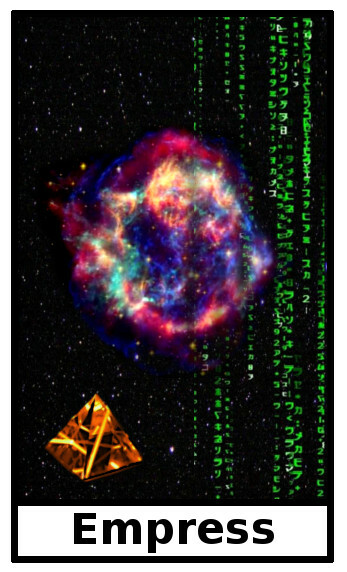 The transporter you see here can not only transport you to any place in the Tree of Life instantly, or to garden part of the Starship (Empress Garden), but can also be used to alter your DNA or tweak your inner and outer qualities. Program up what you want to do from the console and then step into the transporter. Visit this place when you are ready to birth a new change or reality into form that you been working on, or if you want to understand the nurturing mothering energy of the Empress. The Empress energy is necessary for any new creation because it needs that loving attention at the start so that it will not fizzle out when it meets the harsh demands reality can place on something new. Tricorder: to help you diagnose your reality or any creation you are working on. Take me to Empress Garden.